I would like to take the above two use cases and provide the readers my view on the approach that could be taken towards creating subaccounts and spaces. These are very common use case where there are multiple teams working on applications in different modules like Finance, Inventory management, supply chain management, etc. Each of these teams would have their deployment and delivery strategy and wouldn’t want to share the entitlements across. I am sure there are even more pointers that can be taken from such a demarcation. What stands out is the isolation with regards to the applications belonging to the modules and the landscapes. The landscape consideration is very important for the modules to operate as well as follow the deployment strategy (viz. CICD). There would also be a case where the APIs/URLs used in each of these landscapes like Dev, QA and Prod might differ from each other. Each of the landscapes would want to have clear entitlements that were already planned in advance. There could also be a case where the microservices in each of the modules interact with other services that are within the same module as well as other modules in the same landscape. The identity provider for each of the landscape might differ. A dev landscape would need to be connected to a local/dev-based identity authentication provider. 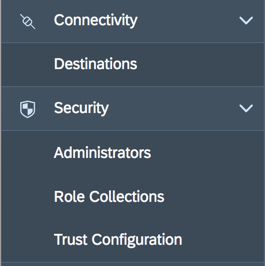 You can also evaluate the SAP Identity Authentication Service and glimpse through my blog on the user identity management. You might want to not only isolate the users from each of the modules but also might have to quarantine from unwarranted access to production/QA landscapes. Note the subaccount facility that provides the luxury of identifying the services per landscape. Note that only the administrator of the Global Account would be able to create subaccounts. Once the subaccounts are created, it will appear as in the screenshot above. You can sense the luxury of specifying the region and provider as well, while creating subaccounts. This is particularly useful when there are teams working in different regions and each of them would be a subaccount in that case. The landscapes in those cases would be demarcated by spaces. The destinations and the security tabs would be used to solve the requirements 1 and 3. 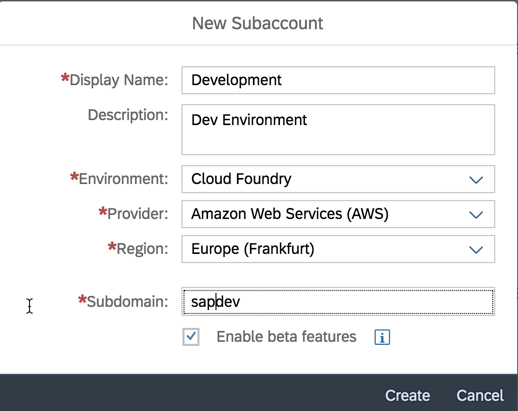 Once the cloud foundry is enabled for subaccounts, you would be able to create spaces and assign entitlements. At the Global Account level, you can assign the entitlements to each of the landscapes depending on your need and requirement. 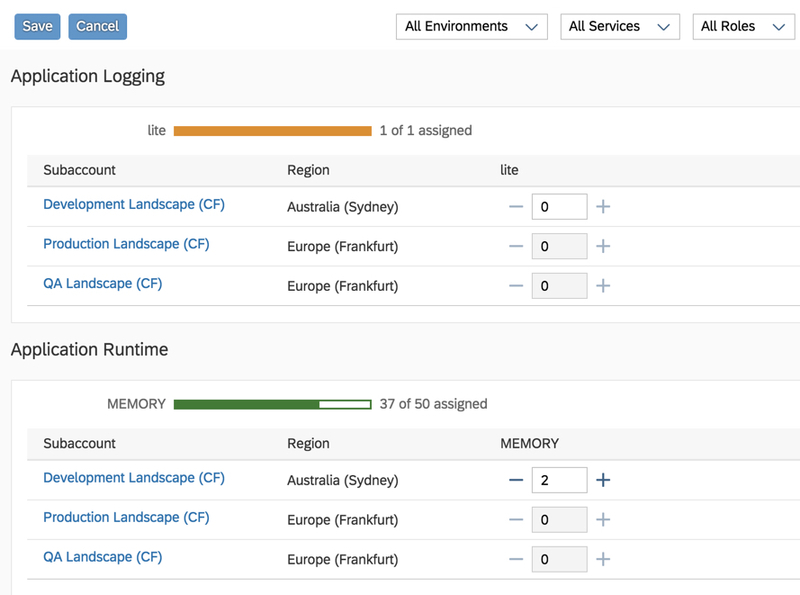 Assign the necessary entitlements to each of the landscapes and save per assignment. Navigate to the space and create members who are working on that module. Note the Space developer added to the finance space. Let’s look at how the newly added member would see the spaces. As soon as the user logs in, the user will see only the Global Account where the subaccount (Development Landscape) and Finance (space) are available. As the user navigates to the space, the user will see only the space in which the user is a member. This way, there is an isolation of module and visibility of modules to the individual members. For those simple use cases where there is no region-based complexity and no module isolation, you can think of having the landscapes like Dev, QA and Prod as just spaces and refer the APIs with different destination services. Hope you find this approach beneficial! !